Established contracts with large martial art, theatre and re-enactment groups/clubs. 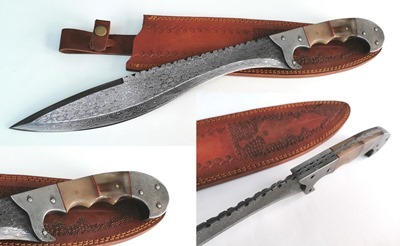 38.5" Overall with a 26.7" hand forged, high carbon steel blade with simulated temper. Genuine rayskin and high quality brown cotton ito. Double pegged and full tang, wooden saya with brown lacquer finish and carved engraving. Nicely balanced, comfortable with high quality finish to the bamboo themed furniture, complete with storage sleeve, excellent value. Official replica of Michonne's katana sword from hit AMC show "The Walking Dead." 40.5" Overall with an unsharpened, hand forged high carbon steel blade. Full tang and double pegged, with genuine rayskin handle wrap and high quality faux leather wrap. The wooden saya is wrapped in brown leatherette with a hand braided white leatherette overwrap and has a genuine leather strap for carry. This is an excellent collector’s piece and makes a the perfect gift for any Walking Dead fan or sword collector. The blade measures 26-3/4 inches while the handle is 12-1/4 inches. Complete with colourful wooden wall plaque, superb. 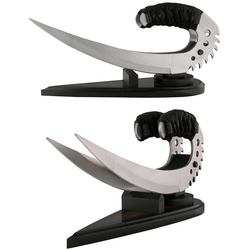 We have recently added new martial arts equipment including instruction manuals are training aids. 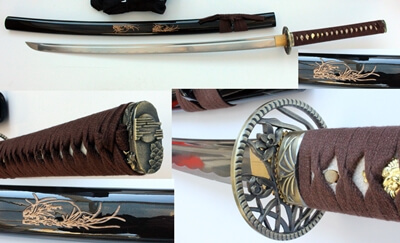 We have also expanded our functional japanese swords (samurai swords) sections with several new swords which have just come onto the marketplace.